This week's Free GM Resource is a highlight of a cool community project called the Exquisite Corpse Dungeon. Technically I'm pointing out the more recent 2nd project, but here is a link to the 1st as well. The Exquisite Corpse Dungeon is a series of HUGE maps that are broken down into small sections, with each section being drawn by one artist. At best the artist knows just a sliver of the map piece before it, just enough to make the appropriate connections from the old section to the new. This can make the overall map look like somewhat disjointed, but it does make for an interesting collaborative effort. The final map comes in at a huge 18" x 48". I can't speak for anyone else, but I loves me some big-assed maps. I can't wait to get my skills up to the point where I could contribute.....well, at least to the point where folks would want me to contribute. 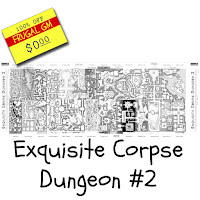 Until then I'll be like everyone else and enjoy the Exquisite Corpse Dungeons.